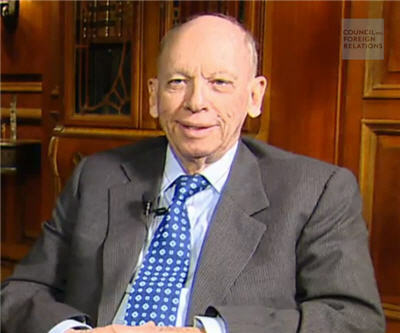 Byron Wien, Vice Chairman at Blackstone Advisory Partners, one of the world's largest investment firms, has 10 predictions that may surprise markets in 2013. Wien defines a "surprise" as an event which the average investor would only assign a one out of three chance of taking place but which he believes is "probable", having a better than 50% likelihood of happening. The legendary investor has some good news for China watchers, gold bugs, commodity traders, and mining and drilling equipment manufacturers but oil players – especially Canada's oil sands – would probably struggle in a market of US crude at $70 a barrel. Iran announces it has adequate enriched uranium to produce a nuclear-armed missile and the International Atomic Energy Agency confirms the claim. Sanctions, the devaluation of the currency, weak economic conditions and diplomacy did not stop the weapons program. The world must deal with Iran as a nuclear threat rather than talk endlessly about how to prevent the nuclear capability from happening. Both the United States and Israel shift to a policy of containment rather than prevention. A profit margin squeeze and limited revenue growth cause 2013 earnings for the Standard & Poor’s 500 to decline below $100, disappointing investors. The S&P 500 trades below 1300. Companies complain of limited pricing power in a slow, highly competitive world economic environment. Financial stocks have a rough time, reversing the gains of 2012. Intense competition in commercial and investment banking, together with low trading volumes, puts pressure on profits. Layoffs continue and compensation erodes further. Regulation increases and lawsuits persist as an industry burden. In a surprise reversal the Democrats sponsor a vigorous program to make the United States independent of Middle East oil imports before 2020. The price of West Texas Intermediate crude falls to $70 a barrel. The Administration proposes easing restrictions on hydraulic fracking for oil and gas in less populated areas and allowing more drilling on Federal land. They see energy production, infrastructure and housing as the key job creators in the 2013 economy. The new leaders in China seem determined to implement reforms to root out corruption, to keep the economy growing at 7% or better and to begin to develop improved health care and retirement programs. The Shanghai Composite finally comes alive and the “A” shares are up more than 20% in 2013, in contrast with the previous year when Chinese stocks were down and some developing markets, notably India, rose. Climate change contributes to another year of crop failures, resulting in grain and livestock prices rising significantly. Demand for grains in developing economies continues to increase as the standard of living rises. More investors focus on commodities as an investment opportunity and increase their allocation to this asset class. Corn rises to $8.00 a bushel, wheat to $9.00 a bushel and cattle to $1.50 a pound. Although inflation remains tame, the price of gold reaches $1,900 an ounce as central bankers everywhere continue to debase their currencies and the financial markets prove treacherous. Wien has posted a surprise list every year since 1986, when he was chief investment strategist for Morgan Stanley in the US. Image of Wien from January 2012 from a Council on Foreign Relations talk.